under the Advance Reservation Period (ARP) with which the passengers can book train tickets just one day before the departure of trains under the tatkal quota. 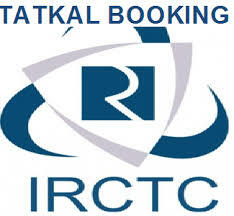 IRCTC has slashed the advance reservation period of tatkal ticket booking window to one day from two days. IRCTC has prescribed tatkal ticket charges, timings. Step 1: Login to IRCTC e-ticketing website: www.irctc.co.in. Step 2: Enter the source station and destination station on the “Book Your Ticket” page. Step 3: Enter the date of journey and class of travel. Step 4: Click on ‘Find Trains’. Step 5: The list available trains plying on the selected routes will appear. Select the ‘Tatkal’ from the drop down list given in front of ‘Quota’ option. Step 6: Now, click on ‘check availability and fare’. Seat availability and fare of the selected class will appear. Step 7: If the seats are available, then click on the ‘Book Now’ option. Step 8: Confirm the booking of tatkal tickets by clicking on Ok on the new dialogue box. Step 9: Enter passenger details such as name, age, gender, food choice, seat preference, mobile number, preferred coach id (if any). Enter the details of the child, if travelling with children below 5 years of age. Step 10: Enter the verification code and click on ‘Continue Booking’. Step 11: Again click on ‘Continue Booking’ on the review booking page. Step 12: Payment window will open, select the payment option to proceed and pay the required amount. Please note, a maximum of 4 tatkal tickets can be booked per PNR and senior citizens quota is not allowed with tatkal quota. Passengers can opt for travel insurance if they want to for Rs 0.49 per passenger.